Language Spam is a pain because it’s often hard to detect. 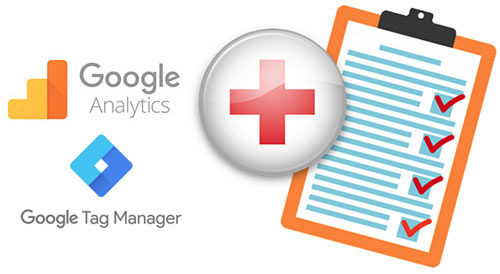 Google Analytics Language Report Spam is easy to remove. Spammers keep finding new ways to screw up our reports so we must find new ways to keep our data clean – spam traffic messes with metrics like Sessions, Time on Site and Bounce Rate (often at 100% or 0%). We first started seeing the Trump spam just as the 2016 US presidential election vote was winding down. This time they used the language HTTP header to send messages as languages and used legitimate sites like Twitter and Reddit. Such information is sent automatically to GA by most browsers in the form of short abbreviations, such as “en”, “en-gb”, “en-us”, “es”, “fr”, etc. It is also combined with referral spam, with multiple domains listed as source/medium, including abc.xyz, brateg.xyz, budilneg.xyz, begalka.xyz, bezlimitko.xyz, bukleteg.xyz, boltalko.xyz, biteg.xyz and others. So it is a two-way attack trying to get the user’s attention to both the fake referer domains and to the language report, most likely because of its prominent placement on the Google Analytics report homepage. I strongly recommend you break your properties into the view layout below and always have one view that contains just your raw data (with no filters) so you always have a back-up. I would also recommend first trialling any new filters in a test view before applying filters to your main view. 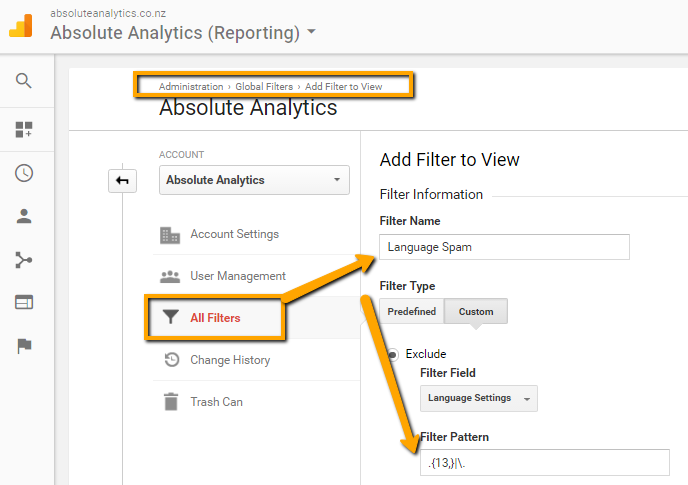 Also, add an annotation in your reports for later analysis. That way if you’re looking back and wondering why there was a decrease in your bounce rate or 8 months from now a loss of referral traffic, the rest of your team will know why and not waste valuable time huddled around the screen scratching their heads. 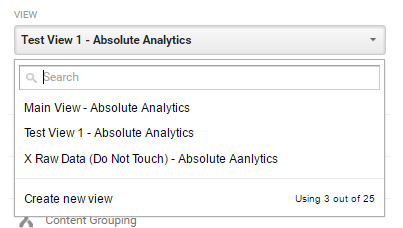 OK that’s done, how do I remove the Google Analytics Language Spam out of my reports? Easy, the answer is you can’t, but you can hide it with advanced segments. Depending on how much spam you have received will determine how worthwhile this is as you will have to constantly use this segment for all reports to remove the data. To protect yourself from future Spam you have two options: keep up-to-date with all the new spam that is created out there and create filters accordingly or ask a professional to take care of this problem for you and never worry about this problem again. P.S: This service (sorry little plug) is covered under our new monthly maintenance plan at $99+GST per month, per website. We’ll keep your reports free of spam, check your goals and monitor your analytics notifications for problems with your data. Contact Us for more information. Mark and the Absolute Analytics team.